Win a Samsung Curved TV this Weekend! To enter, deposit between Friday, January 20th and Monday, January 23rd. Players will receive entries into a raffle held just after 12am ET on Tuesday based on the amount of the deposit. Deposits greater than $100 will receive 10 entries. Win up to £700 in real money prizes from Friday to Sunday. For every 96 tickets you buy, you'll get another 14 free. The Promotional game runs every Friday- Sunday, at 18:00, 20:00 & 22:00 GMT. NOTE: The Weekender Room is open ONLY to registered funded players who have made a single deposit of £50 6 days prior to each game. **General terms and conditions apply. Winning will be granted as real money, no wagering requirements will apply. Legs warmers, shoulder pads and Rick Astley! Oh My! Join them on Sat 9th and Sun 10th Sept for the 80s weekender featuring guaranteed 1-line and Full House prizes every half hour from 8pm to 10pm! How much will you get? Deposit from Friday, Sept 22nd to Sunday, Sept 24th and find out. Players with ratio over 70% do not qualify for the offer. Players with 2 approved/pending payouts within the last 14 days don’t qualify. Players over 90% don’t qualify. Players need to log in each day to get them. Freebies expire after 48 hours. The Apprentice, tv show, is finally back so use code APPRENTICE this weekend (September 29th to October 1st) for unlimited 140% bonuses! Dear LBB'ers, we have some great news for you! Unlimited bonuses weekend has started at Amigo Bingo ! Receive a $100 EXTRA Bonus every time you deposit! Players over 70% ratio don’t qualify for the offer. Bonus expires at midnight, October 8th, 2017. 5 Players with the most points will WIN 50 Free Spins! Win up to £500 in the Xmas Gifts Room! Have a nice weekend, dear LBB'ers! Hey, LBB'ers! Each time you bingo during The Naughty or Nice Team Event you win sparkly points for your team. The team collecting the most sparkly points will win and share the 1st place prize. Promotion plays 8th - 24th December. This Promotion is open to registered funded players only. Anyone playing less than 100 games in any given team bingo weekend will only be awarded 1/2 the prize. Anyone playing 25 - 49 games in a weekend session will be awarded £1 Bingo Bonus. Anyone playing under 25 games will not recieve a prize. Chat Games will not play during Team Event hours. Players must purchase a minimum of 3 tickets per game to count. WR: 4X; 40X of IG Bonus Funds. 1. Use code SPIN to make a first deposit of £10 or more. 2. Open the Fruit Shop game. 3. The Prize Wheel will pop up. 4. Give it a spin to see what you’ve won! You could win up to 100 Fair Spins! no WR! Available to existing bgo accounts and once per person/account on first deposit. Not available to customers depositing using Neteller or Skrill as a payment method. Code SPIN must be used when making a first deposit to activate the offer. his offer entitles players to one wheel spin for a first deposit of £10 or more, upon launching the Fruit Shop slot game. Minimum deposit of £10 required to trigger the wheel spin. Minimum withdrawal is £20. Deposit and withdrawal fees apply. Players will have the chance to win 10, 20, 30, 40, 50 or 100 Free Spins. Free Spins can only be used on the Fruit Shop slot game only. There is no wagering requirement on winnings from Free Spins. Join the bingo chat every day in the Main Contest room this Jan 26th-28th weekend and play Australian themed games with incredible $25-$200 GUARANTEED JACKPOTS. The more cards in the game the bigger the pots. 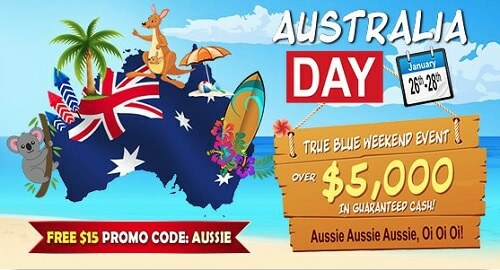 FREE $15: Log in this weekend, find the promo code box in the lobby area and redeem $15 Freebies with code: AUSSIE. • Players need to log in Jan 26thto 28th to redeem the offer. • Offer expires at midnight Jan 28th, 2017. • Once credited freebies expire after 48 hours. Have a great weekend, LBB'ers! Enjoy a generous EXTRA Bonus at Bingo Australia this weekend! From Friday March 2nd and until Monday March 5th. This Extra Deposit Deal is on top of the daily bonus and the loyalty bonuses you always get! FREEBIES! - $20 FREE: Enjoy $20 free automatically this weekend when you log in. This is one of many surprises to come this month! (5) $500 & (5) $200 GUARANTEED GAMES! - Bonus is automatic and expires at Midnight, Monday March 5th, 2018. - Players with ratio over 70% do not qualify for the offer. - Players with 2 requested/approved payouts within the last 14 days don’t qualify. Have a nice weekend, LBB'ers! OVER $15,000 in GUARANTEED JACKPOTS and lots of girly talk! The fun takes place in the main room all day long starting March 8th - 11th, get ready for hours of themed $25-$250 GUARANTEED GAMES with prizes reaching up to $10,000 CASH! • Facebook Contest Deadline March 11th midnight EST. Good luck and enjoy this weekend! Hey LBB'ers, from April 25th until April 30th enjoy playing bingo at Bingo Australia! All games will carry a fantastic FIXED JACKPOT, and there is OVER $13,500 in GUARANTEED CASH to be won. • One poppy flower prize per player only. • Players must claim the extra bonus to the CH in duty. • Player must be in chat to claim the prize. Hey LBB'ers! Join in the Mexican bingo fun and win big at Cinco de Mayo Special! Celebrate this exciting Mexican holiday with fabulous cash prizes to be won each game! Cinco de Mayo is celebrated on Saturday, May 5th and you can join in the bingo fun and play for a share of up to $25,000 in prizes. The Mexican bingo fun starts at 5:00PM EDT in the Spring Bingo room as we play five (5) exciting $5,000 Coverall min $500 top of the hour games with cards costing only $1.50 a card. With games playing at 5:00PM EDT, 6:00PM EDT, 7:00PM EDT, 8:00PM EDT and 9:00PM EDT, you’ll get more chances to be a winner when you celebrate Cinco de Mayo wit unmissable Buy 6 Get 3 Free offer on all Cinco de Mayo Special games. Simply select 9 cards of your choosing and you’ll only pay for 6! Up to $15 FREE and over 250% in Extra Bonuses on every deposit! Freebies based on your loyalty level this weekend! Loyalty rewards: Over 250% in Extra Bonuses on every deposit! For more details visit bingo website!